“One Tier At A Time was invaluable when it came to my wedding. They were my wedding planner from beginning to end and handled every detail in between, which ensured my wedding day was perfect. We wanted something different for our wedding cake and One Tier At A Time suggested mini wedding cakes. 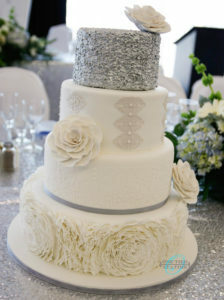 Every guest received their own individual packaged three-tiered wedding cake that was absolutely beautiful and delicious. One Tier At A Time also made us a separate cake for the cake-cutting after dinner. We couldn’t have asked for anyone more professional or helpful and would have no hesitation whatsoever recommending One Tier At A Time to anyone that would like to make their event special.” – Sheri H.
“One Tier at a Time provided cake pops for my summer wedding. I found them to be very professional and creative, with great ideas and suggestions. They eased my wedding stress by taking care of all details and delivered a great product, which everyone loved, on the day of. They come highly recommended! !” – Alessya Q. “One Tier at a Time has been making cakes, chocolates and cupcakes for me for multiple occasions over a 10 year period, starting with my shower cake and goodies, wedding and every function after that (i.e. birthdays and anniversaries). Every time the work is professionally completed with care, expertise, and creativity, not to mention great tasting. One Tier comes highly recommended by myself, my family and friends who have used One Tier’s services.” – Maria Antonietta A.